Laurel Gardens (the Gardens) is located just 1/2 mile off the Parkway East (Route 376) at the Forrest Hills Exit (Number 78A) on Ardmore Boulevard (U.S. Route 30) in the Borough of Forrest Hills (please see map below). This complex is comprised of two modern garden style three story apartment buildings constructed in the 1960s. Each building houses eleven 1-bedroom and twelve 2-bedroom apartments. The Gardens have been totally renovated including new roofs, windows, parking lot, intercom entry system, central fire alarm system, emergency lighting, coin-op laundry equipment, hallway decorations and landscaping. All apartments have been renovated to include new cost efficient electric heating and air conditioning, kitchen cabinets, appliances, vinyl flooring, wall to wall carpet, ceiling fans, mini-blinds, paint and bath upgrades. Some one bedroom apartments are available with balconies. There is plenty of parking in the on-site lot and bus service is available near the door. According to the most recent census, the Borough of Forest Hills has a population of approximately 6,500. 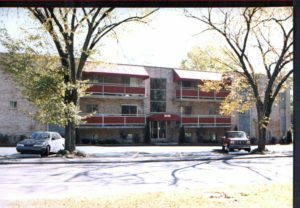 Forest Hills is located approximately 8 miles east of the City of Pittsburgh central business district and 25 miles east of Pittsburgh International Airport off the Parkway East (Route 376 East) at exit 10. The major access road through Forest Hills is U. S. Route 30 East, also called Ardmore Boulevard. Forest Hills features two shopping centers, both on Ardmore Boulevard, approximately 1.5 miles east of Laurel Gardens. Additional shopping is available in Monroeville approximately 5 miles further east on the Parkway East. Located there are numerous restaurants, stores, shopping centers, theaters and the noted Monroeville Mall. A swimming pool and park, owned and operated by the Borough are located on Braddock Road. Forest Hills maintains a full time paid police force, a volunteer fire department and a full time paid ambulance service. The nearby hospital serving the area: Forbes regional in Monroeville. The University of Pittsburgh Medical center is only 7 miles away. Residents of Forest Hills attend the Woodland Hills School District. The municipal wage tax rate is 1%.